This grand Victorian villa is now an outstanding 5-star guest house offering rich, elegant en suite rooms, free Wi-Fi and free parking, only 10 minutes' walk from Windermere. Surrounded by the stunning natural beauty of the Lake District, Newstead is just a 15-minute walk from Lake Windermere. Built in 1897 with traditional, local Lakeland stone, the house still boasts many beautiful original Victorian features including its splendid hall and staircase, marble fireplaces and mahogany woodwork. Bland, soulless, contemporary design has been avoided in the decoration of the house, in favour of the elegant styles of the Arts and Crafts, Art Deco and Art Nouveau movements, recalling the splendour of Victorian times. There are 9 rooms, all individually decorated, with their own unique charm. 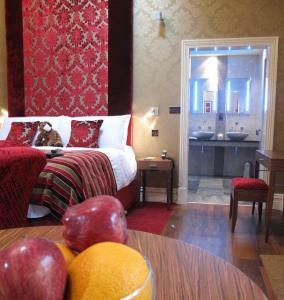 All of the rooms have en suite showers, TVs and tea/coffee making facilities. Guests also enjoy free use of a private leisure club with a swimming pool, which is just a few minutes' drive away. 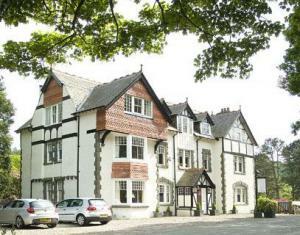 Family-run country house hotel set in 3 acres of delightful grounds, overlooking Derwent Valley and the Fells beyond. Broughton Craggs provides a warm, friendly service and has won various Silver awards: Plates - 98, 99 & 00, Key - 2001 Above the banks of the River Derwent with rolling views over the Lakeland Fells, Broughton Craggs Hotel, with its own extensive grounds and gardens, offers the visitor the opportunity to enjoy the special hospitality and first-class cuisine of a hotel in a tranquil setting. On the edge of a traditional Cumbrian village only 3 miles from the centre of Cockermouth and 7 miles from the Solway Coast, Broughton Craggs is the ideal base for the business traveller or those requiring a wide variety of activities and interesting visits. After a hard day, relax around a roaring log fire in one of our lounges. Beautifully set within its own grounds in the picturesque village of Troutbeck, this charming guest house provides the ideal base from which to explore the natural beauty of the Lake District. High Fold Guest House boasts a peaceful rural location, less than 3 miles from Windermere and the Lakeshore, and approximately 4 miles from Ambleside. This makes it the perfect choice for walkers and cyclists, or for those looking to escape the stresses of everyday life. All of the 5 bedrooms are individually decorated and named after a local landmark. Most enjoy wonderfully peaceful views over the surrounding Fells. The dining room also enjoys beautiful countryside views. Nestled in the picturesque village of Elterwater, amidst the imposing Langdale Valley Fells, this traditional Lakeland inn provides 9 comfortable guestrooms at the heart of the Lake District. Surrounded by wonderful walking and cycle routes, The Britannia Inn is just 10 minutes away from Wordsworth's Grasmere and 3 miles from Ambleside and Lake Windermere, with Hawkshead and Coniston just a short distance further. Dating back over 400 years, The Britannia Inn still retains many original features, including oak beams, slate floors and open fires. Today it boasts a wonderful pub serving real ales and home-cooked food, alongside a welcoming lounge area and sheltered patio. The Wordsworth Hotel is situated in the heart of Grasmere and has peaceful lounges and a conservatory looking out across landscaped gardens to the fells beyond. The comfortable bedrooms come with a flat-screen TV, and an en suite bathroom with bath, shower, toiletries and thick towel bathrobes. The award-winning Prelude restaurant offers fine-dining with an extensive wine list. A second dining option is the Dove and Olive Bistro. Wi-Fi is available through the hotel and there is ample parking for residents. 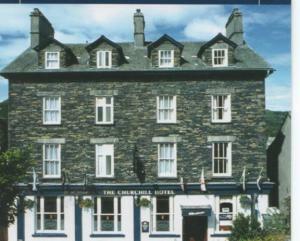 Next to the hotel are the famous Grasmere gingerbread shop and St Oswald's Church where William Wordsworth is buried. Ellerbrook House is small, family-run guest house in a quiet leafy street just a few minutes' walk from shops, cafes and restaurants, and a 15-minute walk from Lake Windermere. The staff pride themselves on high standards and quality, and provide a friendly, welcoming and comfortable environment for exploring the Lake District. 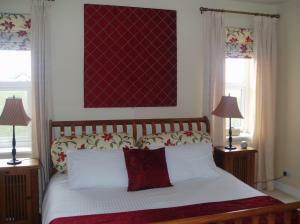 Rooms are well-appointed and situated on 2 floors, with either en-suite or private facilities. All rooms are well equipped with an LCD TV/DVD and hospitality tray. 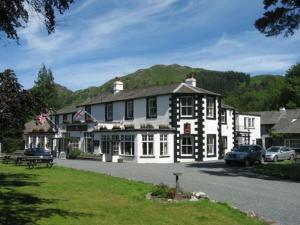 This 3 star quality hotel enjoys the most spectacular settings in the Lake District, Glenridding close to Patterdale in 15 acres of grounds with lawns sweeping to the shores of Lake Ullswater. Part of a unique group of five family-run hotels, The Inn on the Lake offers a quality of service appealing to the family, leisure, group and business markets. 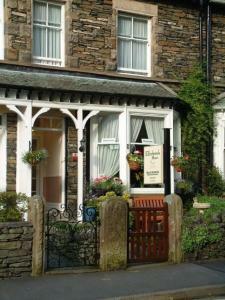 On the south-west edge of the Lake District, this small and beautiful B&B has 2 lovely rooms with excellent views. Stunning coastal scenery and peaceful Silecroft Beach are nearby. There many activities in the local area, including golf, watersports, horse riding and Muncaster Castle. Guests can share a lounge which has a TV, DVD player, Wii, games, books and a log fire on winter evenings. At Newstead House you can enjoy a breakfast with homemade jams; afternoon tea; and evening meals featuring fresh local produce. This family-run, 5-bedroom traditional pub overlooks the River South Tyne. It has traditional cider and cask ales, homemade bar meals and welcoming, friendly staff. Alston is the highest market town in England and is 18 miles (29 km) from the M6 and the Lake District. The Cumberland Hotel is an ideal stopping-off point on the C2C cycle route and Pennine Way. Some bedrooms have beautiful views with a backdrop of the North Pennines. There is secure storage for bicycles and dogs, as well as a beer garden and a patio. There are opportunities to walk, hike, cycle and play golf in the local area. The South Tynedale Railway is not far. Rothay Garden is "Heaven on Earth", said the Yorkshire Post newspaper. In 2 acres of riverside gardens, this 4-star hotel has stunning designer rooms, chic lounges and conservatory restaurant (2 Rosettes). 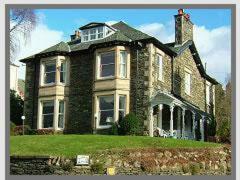 The ideal choice for a relaxing short break or holiday, Rothay Garden has recently undergone a ?2 million redevelopment. It now offers 25 beautiful bedrooms, 5 amazing loft suites, cosy lounges and a bar. The candlelit conservatory restaurant has garden views and award-winning food (2 AA Rosette standard). Offering a peaceful Lakeland retreat, Rothay Garden is set in the heart of the Lake District with easy access to all main attractions, including Ambleside, Windermere, Keswick and Kendal. Set in its own mature grounds located in the centre of the Lake District with views of Lake Windermere. We are only half an hours drive from Junction 36, M6. Here at the Burnside Hotel you can enjoy a wide choice of en-suite bedrooms and private suites, spacious lounges; a widely acclaimed restaurant, well stocked bar and incomparable Parklands Country Club, our all weather leisure centre. A lovely Victorian property offering fine quality bed and breakfast accommodation, situated in an elevated position in its own grounds. Overlooking Keswick-on-Derwentwater and the surrounding mountains, this elegant Lakeland house offers a warm, relaxing atmosphere. Proudly owned by Mark and Sally Huit-Lansbury, their bed and breakfast holds various awards and is featured in many leading guides. With quality and comfort in evidence throughout, the breakfast offered at this lovely guest house includes fresh fruit salads, the best locally farmed produce and free-range eggs. This hotel with spa stands right on the shore of Lake Windermere and boasts unrivalled views across England's largest lake. Set in mature gardens with lawns that run down to the lake, the hotel boasts its own private jetties and moorings. It is an ideal base for exploring Lakeland's towns and villages, rural idylls and a multitude of historic, cultural and contemporary attractions. Step outside the hotel and enter the bustling town of Bowness-on-Windermere with its many shops and amenities. Only a short walk away you have lake cruises and the Beatrix Potter Exhibition, not to mention sailing, water sports and golf. Stanley House is a Lake District B&B with en suite bedrooms with stunning views of the fells, gardens and rivers. 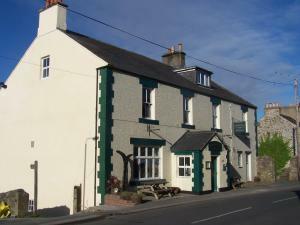 Located in Eskdale, the B&B is ideal for walkers and is a few miles from Wastwater, England's deepest lake. The Ravenglass & Eskdale railway stops at Beckfoot, the local station. Each comfortable room comes with a TV, DVD player with DVD library, and free Wi-Fi. There are 2 ground-floor sitting rooms, one with a wood stove and sofas to laze on, the other with a TV and PlayStation for the children. Breakfast is served in the dining room overlooking the gardens and 2 rivers. On the A69, half a mile (800 m) from junction 43 of the M6 motorway, the hotel offers comfortable, great-value rooms and free parking in a convenient location. The Premier Inn Carlisle (Central) is less than 500 metres from Brunton Park stadium, the home ground of Carlisle United Football Club. The shops, pubs and restaurants of Carlisle's city centre are just 2 miles (3.2 km) away. The hotel has a 24-hour reception desk and some rooms can take 2 adults and up to 2 children (under 16 years). The 2 children also get a free full breakfast when accompanied by an adult eating a full breakfast. An all-you-can-eat breakfast buffet is available each morning and includes scrambled, fried, poached or boiled eggs, and pork or vegetarian sausages. There is also a wide continental selection. The on-site Brewers Fayre restaurant offers traditional, great-value pub favourites in a family-friendly environment. 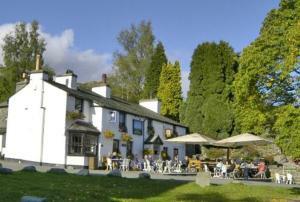 The Scafell Hotel is located in the very heart of Borrowdale, considered by many as England's finest valley. 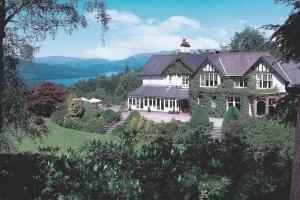 The hotel is surrounded by mighty fells, tranquil meadows and crystal clear waters. The Hotel is situated almost at the foot of Great Gable and the Scafell Massif and is, therefore, an excellent centre for walking either in the valley, along river banks, the Derwentwater lake shore,the fells or on Lakelands highest peaks. For those wishing to tour around it is an ideal centre from which to visit other Lake District locations. Those who are content with gentle rambling or just lazing on restful lawns fringed by trees amidst imposing scenery will be equally happy staying here. The comfortable bedrooms, beautifully decorated and some furnished with traditional antique furniture, are all equipped with private facilities,TV, radio and tea / coffee making facilities. The public rooms have been tastefully furnished, including the elegantly re- furnished lounge and restaurant where one can enjoy excellent fare prepared by skilled chefs. 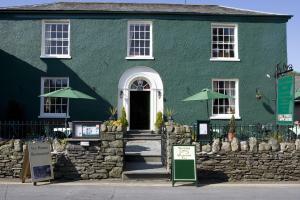 Under the direction for the past 34 years of the owner,Miles Jessop and now newly arrived Managing Director Andrew Nelson who together with the management and staff of the Scafell Hotel offer an efficient and friendly service, so making this comfortable Hotel a perfect base for exploring the Lake District. Just south of the M6 motorway, Premier Inn Carlisle Central North is just 1.5 miles north of Carlisle city centre. The hotel is a comfortable, good-value base with an on-site restaurant and free parking. Some rooms at Premier Inn can take 2 adults and up to 2 children (under 16 years). The 2 children also get a free full breakfast when accompanied by an adult eating a full breakfast. The all-you-can-eat breakfast includes the expected cooked items such as scrambled, fried, poached or boiled eggs, and pork or vegetarian sausages. There is also a wide continental selection. In the heart of the town of Windermere, surrounded by the stunning natural beauty of the Lake District, this attractive Victorian building is now a family-owned guest house and pub. Close to all that the town has to offer, the Oakthorpe and Lamplighter Bar has a good location, only a two-minute walk from Windermere Railway Station and just off the A591, which runs right through the Lake District. Lake Windermere is just 5 minutes away by car or only a 15-minute stroll from the front door. There is a large, free car park. A range of accommodation is available to suit the needs and budget of any traveller. Some rooms have en suite bathrooms and rooms with shared bathroom facilities are also available. Delicious food and real ales are served in both the restaurant and the Lamplighter Bar. Seafood is a speciality, with fresh fish delivered daily from Fleetwood. A Lake District gem, nestled in nearly 2 acres of private grounds surrounded by woodland and a few minutes' walk from town and sea. Hampsfell House Hotel is renowned for great food and wonderful hospitality, offering peace and tranquillity in a beautiful and relaxed setting. Here you will find a home away from home, with comfortable lounges, log fires, stunning grounds and excellent service. There is ample free parking within the hotel grounds. Special offer available from Sunday to Thursday: stay 3 nights and only pay for 2 (between April 1 and October 31). This charming traditional Lakeland house offers comfortable accommodation in a great location, in the centre of the village of Windermere, in the heart of the beautiful Lake District. The superb location makes Lingmoor Guest Accommodation a great base from which to explore the stunning natural beauty and breathtaking scenery of the Lake District, which so inspired Wordsworth, Wainwright and Beatrix Potter. Windermere's train and coach station is just a 3-minute walk away and all of the town's pubs and restaurants are within easy walking distance. This family-run house was built in 1854, by and for the local railway, which arrived in Windermere at that time. Today, the house still retains its beautiful original exterior, its slate roof and several other lovely period features. There are 5 comfortable, modern en suite rooms with showers, each of which is well-equipped with a colour television and tea/coffee making facilities. This modern hotel is situated one mile from the centre of Cockermouth, an ideal location for those on a business trip or exploring the Lake District. At the Shepherds Hotel you will receive a warm welcome from our friendly staff. The restaurant is open throughout the day, serving a selection of snacks, tea and coffee, scones, cakes, hearty home-made soup, sandwiches and delicious bar meals. The evening menu is freshly prepared by our chef, offering a varied selection which includes daily specials. 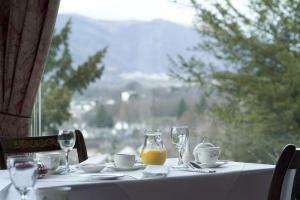 In the morning, enjoy a full English breakfast before exploring this breathtaking part of the Lake District. Expect the unexpected in this new concept guest house, with a 'Highly Commended' AA award, 1 minute's walk from Lake Windermere and its beautiful bustling village of Bowness-on-Windermere, the heart of the English Lake District. Owners Stephen and Louise have established something fresh and exciting at The Cranleigh. The atmosphere is friendly and informal, while the accommodation has all the cutting edge style of an expensive boutique hotel. The lounge is classic style, with open fire place, leather furniture and mellow decor; a great place to relax with a glass of wine, champagne or one of the local ales. Hearty breakfasts are served in equally stylish surroundings. Bedrooms are simply stunning and totally contemporary, each with an individual style from a professional interior designer. All have luxurious goose-down duvets and fine cotton sheets, iPod docking stations, large screen TVs, DVD players (with free access to a large collection) and free Wi-Fi access. The fully tiled en suite bathrooms have designer fittings by Villeroy Boch, heated floors, mood lighting, dual-fuel towel rails, spacious shower enclosures and bathrobes. Those with air spa baths have a mirrored TV at the end of the bath for utter indulgence. As a bonus, guests have free use of nearby leisure facilities, including a swimming pool, sauna, gym and squash courts. The Cranleigh has 14 car parking spaces, is totally non-smoking and is unsuitable for children. Awarded 'Highly Commended' status by the AA in 2009, placing The Cranleigh within the top 10% of UK 5-star guest houses. 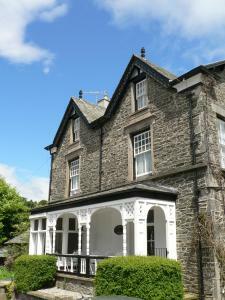 Located in the centre of Ambleside, with private parking and all the amenities literally on your doorstep. Within the hotel there are two bars: the larger Popular bar and the more tranquil Monty's bar with an open fire etc. A traditional bar menu is served in the the main bar with a 10% discount for residents. Immersed within spectacular open countryside, yet only 3 miles away form Carlisle city centre, this small family-run business is the ideal base from which to enjoy the Lake District, Hadrian's Wall and South West Scotland. Set within an acre of beautifully landscaped grounds, with safe off-road parking, the hotel is situated on the A689 Bramton Road, enabling easy access to golf courses, fly-fishing, and Hadrian's Wall cycle path and walking route. Furthermore, you can explore the historic sites and shops in Carlisle. In the evenings, after a long day, you can return to the comfort of the hotel where you can sample high quality, freshly made food in the Wallfoot's restaurant and bar. The chef, Geoff, has designed an original menu inspired by local Cumbrian ingredients. All of the meat used can be sourced to local farms, and the vegetables are fresh and seasonal.